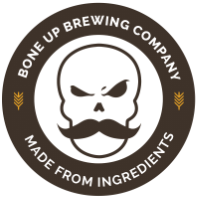 Stats: Dr. Dankenstein - Bone Up Brewing Co. Cheese Pairing: Mozzarella. A dang ol' mountain of it. Music Pairing (Jared's Choice): "Dopesmoker" by Sleep. Best Occasion to Drink: While binge-watching action movies. Brewers' Notes: We love us some good old school dank-as-heck hops around here, so we figured it was high time we gave them a place to shine! This punchy lil' throwback is perfect for sharing with some buds and reminiscing about the good ol' days, so kick back and relax and get Dank!